We created 2 example scenes, which demonstrate all main features of BGDatabase. They are located here (Assets\BansheeGz\BGDatabase\Examples\Scenes\BGExample1.unity and Assets\BansheeGz\BGDatabase\Examples\Scenes\BGExample2.unity) and they are meant to be run with default database, which is shipped with the package (Assets\BansheeGz\BGDatabase\Examples\Resources\bansheegz_database_default.bytes ) If you want to learn more about BGDatabase and you have some minimal programming skills- this is probably the best place to start. Example scenes are simple game prototype, in which you need to gather all objects on 2 levels. Every object has it's own type and some amount of gold attached. As soon as all objects are gathered, new ones will be spawned. The progress can be saved and loaded. Here is the database schema, we use for that example. We use code generation in this example (and we strongly recommend you to use it too). The long story short- instead of using basic API like this entity.Set("gold", entity.Get<int>("gold") +1)); code generation allows you to use code like this entity.gold=entity.gold+1;. As you can see code generation provides huge benefit, you can learn more about code generation here . Some non relevant code is omitted. BGCollectable.cs- This script is attached to every collectable object. This script is hooked to a database by extending from BGM_Collectable class (generated by code generator), which in turn is extended from BGEntityGo- our component we use to connect GameObjects to database. 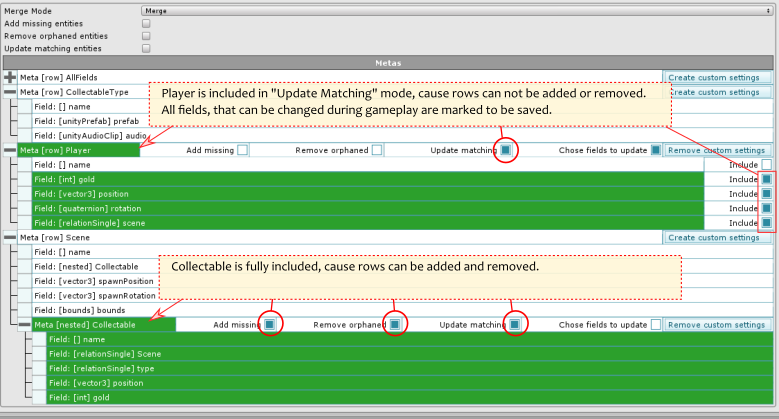 When new collectable object is spawned in the scene by BGSpawner.cs, Entity field is assigned- and object become linked to a particular table row. Play sound effect when object's collected. Remove the object when it's collected from scene and from database. BGGoToScene.cs- this script is attached to a portal to another scene. When the player collides with this portal, he's moved to another scene. This script is also hooked up to a database, namely to Scene row, pointing to a scene to load. When the player collides with this object, script read data about this scene from database, updates Player table with position and rotation from Scene table and loads target scene. BGSpawner.cs- this script fills database with new objects and also spawn them to the scene. It hooked up to Scene table. It uses database events, to find the moment all objects are collected. BGPlayer.cs- this script is attached to the player and hooked up to a first row of Player table via extending from BGM_Player. It implements BGAddonSaveLoad.BeforeSaveReciever interface to ensure OnBeforeSave method is called before saving. In this method it saves it's own position and amount of gold to the database, so while saving those values will be put to the save file.